Manchester was alive and buzzing this past week as Journeys Festival showcased the talents of refugee artists from around the world. The 10-day festival, which was held at various venues across the city, aimed to break down barriers and explore the refugee experience through music, poetry, theatre, and talks. On Sunday shoppers and visitors to the city centre were treated to a mix of Afro beats, choirs, and orchestras on the world music stage. 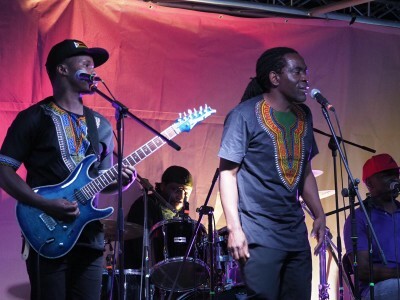 Highlights included Zee Guveya & The Heritage Survival Band, a group originally from Zimbabwe who are now Manchester based. Their Afro-fusion beats and smooth vocals drew in the passing crowds with some not able to hold back the dancing. The crowd was left chanting "one more song" with organisers having to disappoint due to strict council licensing rules. Susan Herbert, who came across the event while out shopping with her daughter, said: "In a world of negative press about refugees it is really refreshing to have an event showcasing the talent of those who have had to sadly flee their homes." "The atmosphere here is great, I wish I had a chance to see more of the performers"
The festival is part funded by the Arts Council and Manchester City Council with support from organisations such as the UN Refugee Agency and the University of Manchester. The festival is in its third year and really adds to Manchester's cultural calendar. It is definitely worth checking out when it returns in 2019 but if you cannot wait it has a further stint later this month in Portsmouth.